An undefeated boxer Floyd Mayweather Jr (50-0) will fight in Japanese promotion Rizin Fighting Federation! Mayweather became world-wide known for the $100 million fight versus UFC superstar Conor McGregor. Despite “Money” recently accepted Khabib Nurmagomedov’s boxing match callout, ” The Eagle” will have to step in line. The Japanese promotion officially announced the information on Monday morning press conference. “Money’s” opponent is going to be Tenshin Nasukawa. The two will fight at RIZIN FF 14 on December 31, 2018, in Saitama, Japan. Tenshin Nasukawa (27-0, 20 KOs) is an undefeated kickboxer. He is one of the most talented Japanese fighters. Nasukawa defeated Yusaku Nakamura at RIZIN FF 10 on May 6, 2018, via second-round TKO. At Rizin FF 13, on September 30, 2018, he was better than the former Shootofighting champion Kyoji Horiguchi via unanimous decision. But Tenshin Nasukawa hopes he will be the first man to defeat Floyd Mayweather Jr. When it comes to the weight class and rules, Ariel Helwani said nothing is officially known yet. Regarding the rules and weight, Rizin chairman Nobuyuki Sakakibara said “we still have some more work ahead of us.” Everyone I’ve talked to said they’d be shocked if it’s MMA. But Floyd Mayweather Jr says this is “a special bout” for him. He also doesn’t pay too much attention to the weight class. Mayweather calls this fight a “special bout” and that he’s not really worried about weight class. The legendary counter puncher has too many accolades to name. Mayweather holds numerous boxing titles under WBO, WBA, and WBC, to name a few. The five-division champion has defeated the likes of Ricky Hatton, Shane Mosley, Miguel Cotto, Marcos Maidana, and Andre Berto. He has also racked up wins in some of the most financially successful pay-per-view events of all time against Oscar De La Hoya, Canelo Alvarez, Manny Pacquiao, and most recently, UFC superstar Conor McGregor. Despite being 41-years-old, “Money” has never slowed down. And he is slated to bring his talents to Japan for the first time ever to take on the incredible phenom known as “Teppen” Tenshin. Stay tuned for future news regarding the rules the bout will be contested under, as well as other match-ups for the card. As much as we can see, this is the collision between experience and talent. Both fighters are undefeated, but Nasukawa is 21 years younger. Yet, it needn’t mean anything. What are your thoughts on the rules? Boxing, kickboxing, MMA? Also, how much money do you think RIZIN FF had to spend to make “Money” fight? 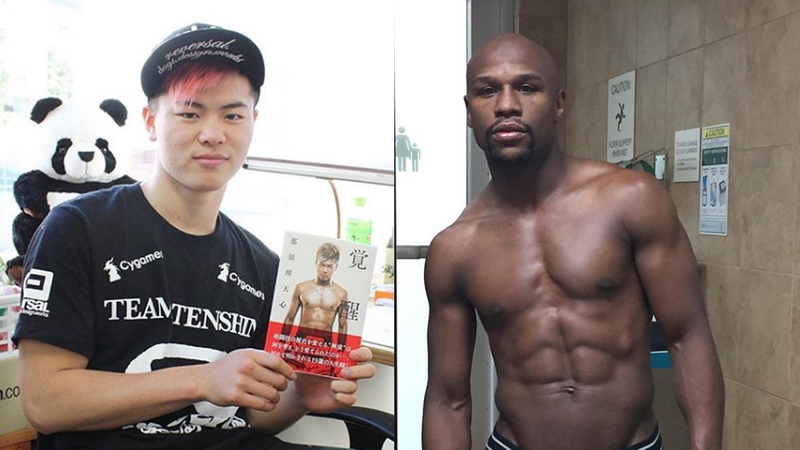 Do you think Tenshin Nasukawa will be the first man to put Floyd Mayweather Jr to sleep? Floyd Mayweather Says He Won’t Fight Tenshin Nasukawa!